Step 1 of the 3 Step Programme. NiQuitin Clear patch, with unique Smart Control technology, provides a rapid release followed by a controlled and continuous delivery throughout the day for 24 hours. With nicotine in the adhesive NiQuitin patches release nicotine as soon as the patch is applied. When worn for 24 hours, they help protect against morning cravings but they can be worn for 16 hours if you prefer. No other patch is more effective. It's clinically proven that using NiQuitin patches can double your chances of stopping smoking compared with willpower alone. For best results follow the full 3 Step programme. Step 1 is for smokers of 10 of more a day. 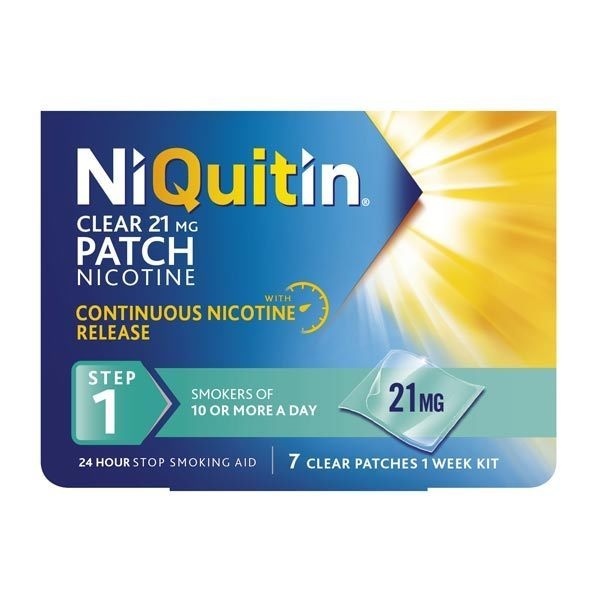 NiQuitin Patches are stop smoking aids. Contain nicotine. Requires willpower. Always read the label.